L 14 1/2″ (37 cm) W 36″ (91 cm). Description: Sexes similar. 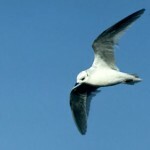 Breeding adults have black head, gray back, white underparts, and red-orange bill. 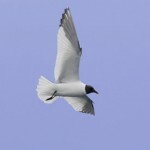 In flight, gray wings show black-and-white wing tips and a distinct white bar that separates the black areas from the gray. Pale gray central tail feathers. All winter birds show a dark half-hood. First winter bird shows gray back, brown wings, black bill, and white underparts. Juvenile is similar to first winter adult but has brown back. Food: Feeds mainly on insects, including those that are crop pests. Habitat: Migrants can be found on plowed fields, often following the moving plow in large flocks. Large prairie marshes with extensive areas of semi-open emergent vegetation are used for breeding. 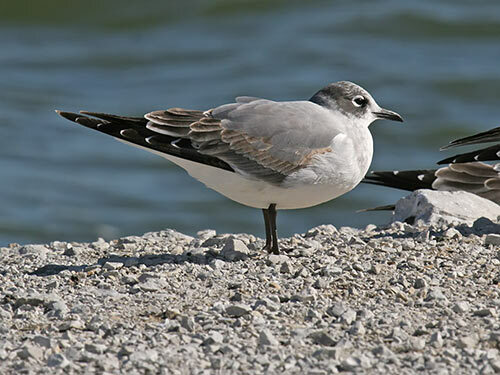 Where in Nebraska: Abundant spring and fall migrant, and rare summer resident. Only known breeding records from Garden County. 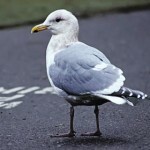 Fun Facts: Molts its feathers twice a year unlike other gulls that only molt once.